The volume chart above relies on the PIOMAS model. The model seems fine for predicting the summer minimum near the beginning of the melt season. See for example, the predictions for 2008: http://psc.apl.washington.edu/IDAO/seasonal_outlook.html Here they made an essentially correct prediction of substantially higher ice in Sept 2008 than Sept 2007. During the previous winter (2007-2008) they wrote a paper predicting the 2008 summer ice extent: LINK In this paper they predicted less ice than 2007 (a new record low) provided that weather forcings (not part of their model) remained substantially similar to 2007. Apparently they did not because the prediction was wrong. Unfortunately I have yet to find a followup paper explaining why the prediction was wrong. The paper emphasizes the use of thickness in the model as a major part of the prediction of extent. But if the thickness is wrong, then the predicted extent would also be wrong. Likewise, if the thickness is wrong in hindcasts when thickness was not measured extensively, then hindcasts of volume would also be invalid. I believe that caveat belongs on fig 2 above. fig. 2 above is not a forecast but a model calculation of ice volume, where the measured relevant parameters are fed in. Section 2 of the paper describes the model, the first paragraph of section 3 describe how they use it in forecast mode. Riccardo, thanks again for keeping track and responding. You are right that the figure is based on a model of the past which is different from a prediction of the future. But it is the same model. Many of the same factors are used both to model the past and predict the future, ocean and air temperatures being major examples. There are other factors can't be predicted or are very difficult to predict due to chaotic effects, like weather patterns and El Nino. As you point out, they use an ensemble for that purpose using the historical factors for the previous 7 seasons. However all of the ensemble predictions were less than the 2008 actual. So either 2008 was a very unusual year weatherwise or the model fails to properly integrate the recorded weather into the calculated ice volume. I'm inclined to believe the latter which is why I don't believe fig 2 above is accurate either. Not to barge in, Eric, but how -much- of figure 2 is inaccurate, in your estimation? How wrong is it? Is it useless? Is the trend reflected in the figure entirely absent? suppose that the ice volume model is perfectly able to calculate the true ice volume when you plug in past and current measured data. You then try to predict next season and plug in a GCM projection of the relevant physical quantities, i.e. weather evolution. It may well turn out to be wrong. What do you conclude? Sure the input data were wrong. Hence, a wrong forecast does not invalidate the ice volume calculations. So it is essential to separate the problem in two parts. The first is validation of the model calculation of ice volume. It has been done and it is shown here. And this is also the topic in this post. If the authors are confident with the results, they may want to try a forecast, but now they're adding the uncertainties of the GCM and chances are they dominate for the reasons you said. I can't tell if something went wrong or if it was just the expected uncertainty, one really need to be an expert on arctic ice behaviour. You might want to ask directly to the authors. doug, I think the latter part of the curve has been verified, which I believe is about 5 years worth of data. Prior to that the verification relies on measurements of the same factors to calculate volume that were used in the volume and extent prediction (made in 2007 for 2008), namely forcings like weather and ENSO. Obviously those are well known for the past rather than predicted for 2008, but the ensemble used a variety of them to attempt to predict 2008 which all resulted in an underestimated ice extent. Not useless and the trend is correct, but I don't know how accurate the long term slope is. Riccardo, keep in mind the "perfectly able" is qualified by the need for parameterizations related to the forcings. As a simple example, the extent and temperatures of ocean currents under the ice. Those calculations are very similar to a prediction except used for the present time. I can't interpret the graph you show without the description of how it was derived, but from the looks of it, the model is verifying about 5 years of actual volume measurements. I understand how the GCM adds both predictive value and uncertainties, but those are certainly not the only source of uncertainties in the model (except in the hypothetical case of a perfect model). I didn't mean that PIOMAS is a perfect model, just that even a hypothetical perfect model would fail the forecast if the input data are not good enough. Stop the presses, this just in: Mayans were right! North Pole to be ice-free (well, except for various edges) September 2012! "What comes out? A better than 50% probability of an ice free September by 2016, with the ice free period increasing by almost a month each year. By 2023, there is a good likelihood of five months ice free, from mid-July to mid December. After that it slows down somewhat, but March and April, the last months remaining, reach zero around 2032-33. We count on you to be first with the good news. Those bottom curves (August-September) dropped 50% (from 10000 to 5000) in just 3+ years! Never mind Lake Superior, you'll be body surfing Baffin Bay in no time. Heh! I'll put my surfboard on my little deuce coupe as I head North To Alaska, where the curl of the Arctic swells generated by the 6-month long summer Arctic Dipole warms the toes of the windsurfers cruisin' the Northwest Passage to Baffin Bay, where the scenery is beautiful and the women...did I mention the scenery? That's a fairly balanced way to report this new study. The same group (University of Washington) ran a model in 2007 forecasting that sea ice would reach a tipping point and polar bears would go down the drain by the end of century. One of the authors did a writeup in RC contrasting what the study actually said vs. what was said about it. That is an interesting read of its own. The full size graph is available there. How fast will the actual message -- that substantial GHG mitigation must happen and soon (emphasized in the quote above) -- get lost as the deniersphere spins this one? We find that cryospheric cooling declined by 0.45 W m−2 from 1979 to 2008, with nearly equal contributions from changes in land snow cover and sea ice. On the basis of these observations, we conclude that the albedo feedback from the Northern Hemisphere cryosphere falls between 0.3 and 1.1 W m−2 K−1, substantially larger than comparable estimates obtained from 18 climate models. Continuing from here, comment #23. "the 30's to 50's drop from very large extents to less large is only a bit less in magnitude." No, the '30s to '50s drop is a lot less in magnitude. Here is a graph of the Walsh data set, txt file here. Red is September min, blue is March max. Perhaps the variations reported by Mahoney et al 2008 in the Russian arctic are the mid-century blips. By way of contrast, we're on the downward Nantucket sleigh ride. The data set that Muoncounter cited says the data is reliable back to 1953. I figure that is 60 years, not 40. The additional data back to 1900 can be used carefully. Scientists use all the available data to reach the most comprehensive conclusions. It is typical of "skeptics" to deny data that has been carefully gathered because it shows that AGW is much worse. People live in the Arctic and they record the conditions where they live. Explorers kept careful records of ice conditions where they were. Fishermen record the ice edge (watch Deadliest Catch). These records enable comparisions to current data. Cite a reference that says the graphs I have copied are not usable or stop your unscientific comments. It was not my intention to suggest that the ice was flat in the past. The data shows that the ice has been in significant decline because of AGW for longer than the 30 year satelite record. Deniers want to limit the data used to hide the decline in Arctic sea ice. Let me first answer the overt question of the thread: Has Arctic sea ice returned to normal? No, it is still near record lows for the post-Little-Ice-Age period. But there is also a covert question in this thread that came up in the thread linked by Muoncounter above. That question is: Has Arctic sea ice fluctuated in the past (i.e. what is normal)? The Walsh data that muoncounter provided is flat mainly because it is out of date. It doesn't include the Russian data http://nsidc.org/data/g02176.html) For example, the dip in the 30's is nonexistent. There are natural explanations for such dips, for example http://www.agu.org/pubs/crossref/2005/2005GL024254.shtml "The period from 1928–1935 also had a dipole structure in SLP, which contributed to the interdecadal arctic-wide warm temperature anomalies in the first half of the 20th century." Also as I pointed out in the other thread, the main cause of late 19th and early 20th century decline in both hemispheres was recovery from the LIA. The main cause of the current, abrupt decline is AGW plus local feedback from open ocean. I am not trying to hide anything. Overland has a more recent paper http://onlinelibrary.wiley.com/doi/10.1002/joc.1973/abstract attributing the 1920-1940 Arctic warming as partly AGW: "Our findings indicate that early climatic fluctuation is best interpreted as a large but random climate excursion imposed on top of the steadily rising global mean temperature associated with anthropogenic forcing." sorry for being OT and a bit pedantic. Given that your comments are usually scientifically well reasoned, I'd like to suggest to not use the term "recovery from LIA". This term implies a planet that for some reason was pushed out of a well defined equilibrium and is now going back toward the previous (or any other) equilibrium. In reality, as I'm sure you'll agree, the forcings has changed, and are still changing for whatever reason, and the planet is changing accordingly. Riccardo, I will keep that in mind. The LIA was stuck in my mind because I wanted to caveat the record low in sea ice by saying post-LIA. But I actually do not have any evidence in hand that sea ice was lower before the LIA (e.g. MWP), so I should have left that out entirely. Anybody notice Arctic sea ice extent topping out for the winter season? I did - I didn't want to mention it. Too depressing. The melt? Or the Plunge? Looking again at NSIDC today, it seems indeed the max extent was reached some days ago. If it remains there, that is quite low. However, there is till a possibility of a very unusual weather event that would cause an uptick, so a couple more weeks are necessary for absolute certitude on the max extent (note the shape of the standard deviation shaded area going into spring). Interestingly, Antarctic sea ice has been below average and is quite sluggish to pick up growth. The global sea ice area is very far below baseline. Philippe #24: Interesting point on the global area. Looking at the graph it seems like since 2005 the annual minimum area (blue line) has repeatedly been significantly below the long term average (grey line). There have also been several sharp dips in the growth cycle (about 6 months after the minimums) not often seen in previous years. Obviously, most of this is being driven by the collapse in the Arctic and it is too short a period to confirm that a new trend (steeper than the long term decline) has begun. That said, the latest PIOMAS update (included in the article above) shows basically no recovery of ice volume anomaly over the Winter. Not a good sign. This Cryosphere Today graphic has been updated through 2010. PIOMAS: record Arctic volume anomaly. This is in response to your point 5 here. This is not true. In the 70s the north pole melted back only fractionally, while today it is almost completely melting every summer and will probably totally melt some summer in the near future. I am currently engaged in debate with a sceptic over this issue and he maintains that sceptics do not accept the data when it comes to ice volume due to the great uncertainties involved. His main problem seems to be the fact that there are many data points that are estimates rather than actual measurements.I have asked him to provide me with some peer reviwed science that would justify this claim but he has not yet got back to me, although I only posted him yesterday. I am aware that there are indeed uncertainties in this area and that estimates need to be used but are there any papers that demonstrate the reliability and valdity of the data used in measuring sea ice volume? Thanks. peacetracker, some information on Arctic volume uncertainty and validation can be found here and here. The point your 'sceptic' is making about 'estimates vs actual measurements' is belied by the fact that the estimates closely match the actual measurements where those are available. Basically, it is like claiming that if we have a +/- 0.01 C uncertainty on the precise global temperature anomaly at any given time then we should ignore the +0.8 C total change in the anomaly. The 'uncertainty' around Arctic ice volume is mis-used in exactly the same way... we might be slightly off the exact value at any given point, but there is absolutely no question that the volume has dropped precipitously. "These results demonstrate that the model captures ice thickness variability beyond the annual cycle, suggesting that long term spatial and temporal variability may be well represented." The problem I am having is that I am not very scientifically literate, so when it comes to descriptions of models and stats I am liable to just glaze over. This is certainly the case with the above study. Is there any possibility that you could give me a brief summary of the process that is being described in the study and its overall findings, but in laymans terms and as simply as possible. I would be very grateful. Thanks. Actually, if you want a simple explanation your best bet is the last graph at the bottom of the first link in my note above. This shows a comparison of the PIOMAS model volume estimates to a regression analysis of US Navy submarine readings of Arctic sea ice and the ICESat satellite's Arctic ice volume readings. The solid black line shows the PIOMAS model results and the dashed black line the resulting trend. The red line with '+' signs is the submarine regression analysis... basically, this means that they took spotty submarine records of ice thickness/area and used mathematical analysis to fit them together into a trend. The large pink shaded area above and below this line shows the uncertainty range around these values. The red line with triangles on it shows readings from the short-lived ICESat satellite, which measured the surface area of sea ice and calculated thickness based on the measured height of the ice above the water line (which, due to the relative densities of sea water and ice, represents about 20% of the total ice thickness). The red dashed line shows the trend of the submarine and satellite results. Note how closely the ICESat "actual measurements" agree with the PIOMAS 'estimates'. Likewise, note the similarity of the two trend lines. In both cases, they actually show MORE ice loss than the PIOMAS model. PIOMAS itself is also based on direct measurements BTW... they take satellite ice area measurements and estimate the ice thickness based on drilled sample readings, temperatures, past thickness data, et cetera. We thus have three different methods of calculating Arctic ice volume estimates... all of which show close agreement with each other. The detailed paper in the second link covers these issues in more detail and also determines uncertainty ranges by comparing PIOMAS ice thickness calculations to actual measurements of ice thickness in the same areas. Their analysis shows (again) that PIOMAS is actually under-estimating the rate of ice loss. They also found that the volume decline in 2010 was so great that it represented a new record minimum to a degree of certainty outside the uncertainty bounds... that is, even if we assume the prior record minimum year was the lowest possible value in the uncertainty range and 2010 the highest possible value, 2010 would still be a record low. Since then the September 2011 value actually came in lower than 2010, but not outside the uncertainty range. Thanks, thats great. I am not sure I have a full understanding but it is certainly much clearer. I would just like to clarify that I have got your explanation right by puttting what you say into my own words. The PIOMAS model is designed to make estimates of ice volume by using measurements of ice thickness which have been taken by submarine. The model then adds estimates of the amount of ice it expects to find in other areas and from this it gives a trend. (I am not sure how these estimates are arrived at but I'm guessing it is complex and I am not too worried about this). These measurements are combined with satellite measurements of area covered from which we can determine volume. As well as measuring surface area, the satellite can also measure the amount of ice thickness in areas where it can be seen above sea level and from this it is possible to calculate total thickness in the way you have explained. To check the accuracy of the PIOMAS estimates, ice thickness is checked in areas where it has not been checked previously by using the various methods we have already talked about. Results from these checks show that the estimates are pretty good but tend to have a bias towards overestimation of ice thickness. Just to add to this myself, it means that whenever we see these charts that show the rate of loss in ice volume, these are conservative estimations and the loss is probably greater than that shown. Is this the lowest February extent ever? #35 sgmuller: Possibly, but the NSIDC graph doesn't show all the recent years, just 2006-7 which had the lowest Sept extent and is among the lowest through the year, and the 1979-2000 average, which is almost invariably much higher due to the accelerating decline of ice extent. Check out the Daily Graphs page at Neven's excellent Arctic blog for other graphs, including the DMI and NORSEX extent plots. It's fair to say that the current extent is 'down there' with the very lowest for this time of year; whether it's actually the lowest depends on the sensor and extent measure used. Regardless, it's fair to say that the Arctic ice is is not in a good state of health. 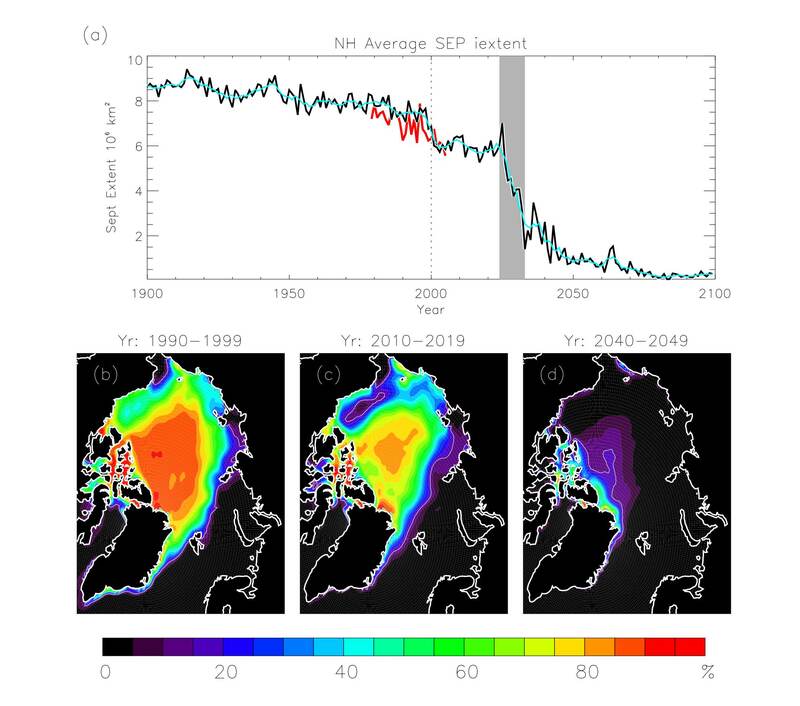 There's an interesting article in the UK Independent where Stefan Rahmstorf makes the link between the extreme present European weather and ice loss in the Barents/Kara Sea, a link suggested in the litereature by Petoukhov and Semenov in 2009. Yah, I know, link only. 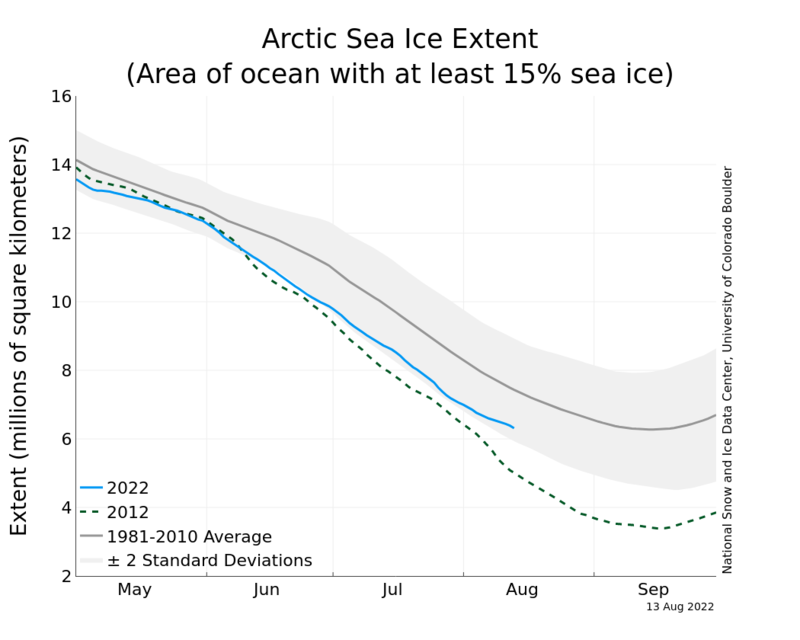 SkS makes Dot Earth on Arctic sea ice decline. As Neven points out, CT sea ice area has now surpassed the record anomaly against the 1979-2008 daily average. The record from 2007 was 2.635 million km2 below the daily average. The record is now 2.705 million km2 below. No, No, everything's OK with Arctic ice (kidding). Steven Goddard has a plot on his site showing that recently, there was the "Most Ice Gain Ever Recorded". What the plot seems to show is sea ice area change from the summer minimum to the cold season maximum. If the summer minimum extent is in a general, pronounced, downward direction, but spring max ice extent is holding steady or decreasing much less slowly it seems maybe the plot could reflect reality. But of course he's misusing that reality to imply something that is not true: i.e there's no "problem", by only highlighting a fraction of the story and then counting on his readers lack of curiosity and predjudices to make the incorrect assumption that arctic is is just fine - instead of for example seeing that the graph would represent the replacement of multiyear-age ice with one year old ice, among other things. "Skeptics", sheesh. Yes, quite striking. Far be it from my place to criticize (because I'm way too ignorant) but the pattern of the last handful of years makes me wonder if we're overestimating the volume of ice left in the Arctic ocean. Those excursions just leap out at the eye. I'm no expert either, but I trust that the recent volume calculations are fine. But I do wonder if the visible bouncing might be due to the shift to satellite observations which might possibly be better at recording the last stages of the summer melt season. That said, I think the explanation for the plunges is that there is now too little year-round ice both in terms of volume and area to keep the Arctic basin functioning as a year-round freezer. In other words, when most of the Arctic Ocean remained ice-covered throughout the melt season, the summer lows in ice area were reached by a fairly steady and slow process of melt around the edges and from below and this helped keep the volume loss low because the ice lid was still mostly in place. The last few melt cycles seem to simply reveal that the thin ice that does manage to form each winter is almost completely melting away with relative ease each summer--and then some of the old ice is also lost, hence the overall decline. We need to remember that in previous years a fairly signficant portion of each winter's new ice survived to live another year, but that is no longer happening. I'd say that the magnitude of the annual range in volume is going to become even more dramatic--with much lower lows and gradually lower highs going forward until the summer ice volume bottoms out, whereupon the seasonally frozen pond/lake comparison will be very clear. I'm curious about the relative temperatures of the ice in the pre-1980 days and more recently. I suspect that the current season's ice of the new Arctic is on average warmer, thanks to the influence of the ocean water beneath it and the relatively warmer air above it, at the start of the melt season than the old season's ice cover, which included more multiyear ice and had a colder atmosphere above it and potentially colder water below it, would have been. I doubt if climate models can explain the 2013 regression toward the mean, dadown. Why? Because big CMIP5 regime climate models aren't really designed for short-term projections. 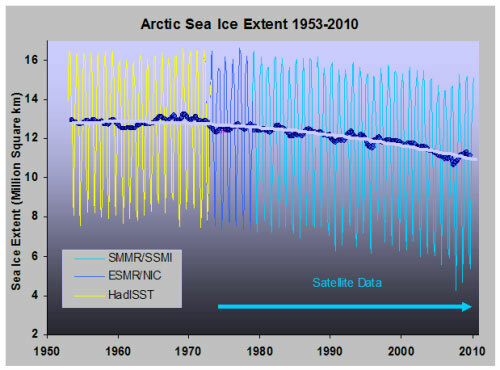 Modeling hasn't done well with Arctic sea ice in general. Note that we're a good 60 years ahead of the CMIP3 ensemble model mean for extent. In other words, Arctic sea ice could stabilize for half a century and the ice would still be ahead of its projected loss. I'm curious, though: what does the 2013 melt season mean to you? I mean, what conclusions do you draw from it? What I would like to know is why the ESA is not publishing a constantly updated graph of ice volume from cryosat as NSIDC does on ice extent. The weather patterns we have had in the summer of 2013 have a tendency to spread ice out (coriolis) and anything over 15% ice cover is recorded by NSIDC as full coverage. The increase in ice extent may be an reading glitch, at least to some extent. The ice volume results should clear up by how much the ice has actually increased between the middle of Sept 2012 and 2013 but the ESA seems oddly reluctant to tell us what their results are. ...and US government shutdown is making data they need unavailable delaying the run. Just wondering how the dismissives will fit this news into their "60% recovery" meme. Nah, they won't, they'll just quit talking about it.